Being born in the 80's means that Star Wars has been apart of my life since the beginning. Moving items with the force is still something I am desperately waiting to come true. When the newest one came out, it was a great opportunity to introduce the fun to my children. We started from the beginning and watched them back to back. When I was trying to come up with new ideas for blankets, I had this idea for a series of hooded blankets. The idea for a Yoda blanket came from this yarn I had and it reminded me of the color of Yoda. Haha. Then I magically had the tan in my stash as well as the brown. See, being a yarn hoarder can be a good thing. 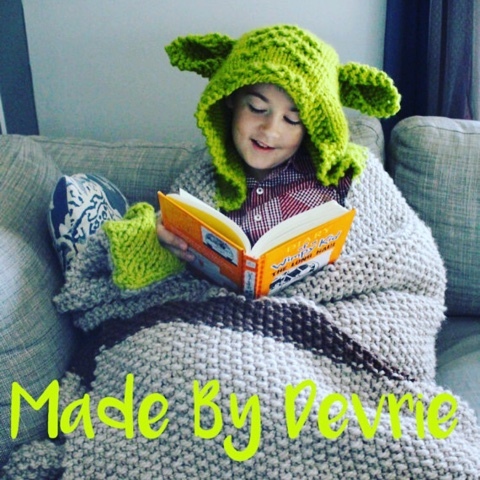 My kids love this blanket already and I am sure I will now need to come up with ways to make all the other characters. The pattern is available in all my shops. It can be made in three sizes. Toddler, child and adult. Great to start on Christmas presents now! !